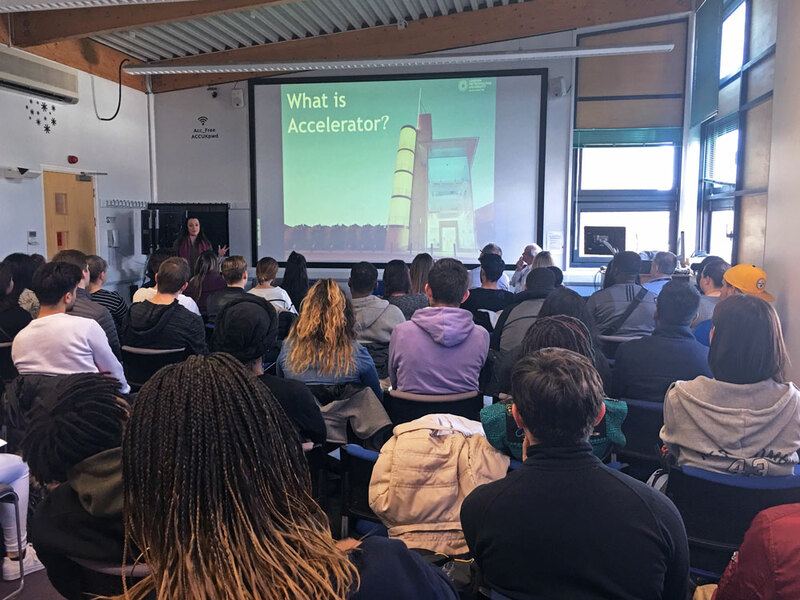 This past week, over 100 London Met students gathered here at Accelerator to speak to entrepreneurs and learn about their journey to success and different aspects of their businesses. These businesses varied greatly. The students were part of the ‘Create A Winning Business’ module that allows students to work on a live project, developing a start-up idea, designing a business model and delivering a pitch. The module explores characteristics of new start-ups, examines market trends and industry attractiveness, as well as focussing on the importance of innovation. Part of this module allows the students to learn about the tech start-up scene in London while hearing from various entrepreneurs that are based at Accelerator. One entrepreneur created a platform called Livoos, offering luxury good services while doubling as a charity. Another built a mobile barbershop app called TRIM-IT. While business types were significantly different, journeys to success often were not. Many of the entrepreneurs shared similar struggles to get their feet off the ground. The co-founder of Measure, an app allowing bar owners track their inventory, spoke about the difficulties of funding, especially when the platform has yet to generate revenue. Him, along with colleagues, had to work other jobs to fund their platform. Other entrepreneurs did the same, but also looked to interest investors or receive bank loans. Another similarity among the different founders was their focus on the customer. The founder of Newport Works, a supplier of smarter studio kits, referenced how he discussed his idea with 100 strangers before the launch. He also noted how he pretended to be the customer of his own brand to see what was missing. This was very much alike to what the founders of Measure did, as they tried to sign people up to the app before it was finalised. Many of the entrepreneurs also commented on the importance of the members behind a platform. A great idea fails to go far if it doesn’t have a committed team, as mentioned by a co-founder of TRIM-IT. However, there was one thing all the entrepreneurs did have in common. They were deeply passionate about their idea. Whether it was working weekends or supporting their platform from their own pocket, they all wanted their idea to be as successful as possible.